At the Agency as part of our transformation we have identified broadly the type of value we want. 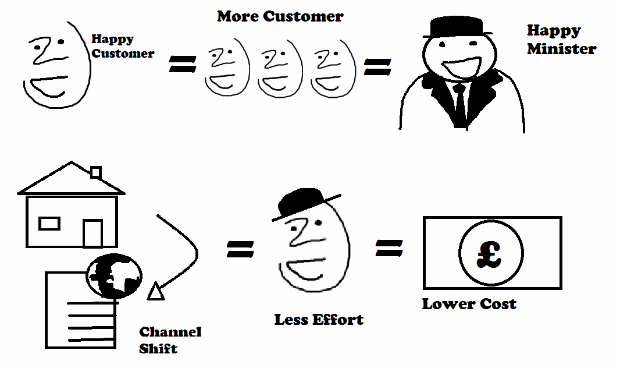 Better customer experience, more users, more completion, low unit cost, but in reality we need to go further. Our services were set up for a purpose, and if we deliver more effective services we should actually see more outcomes. In other words we become better at delivering on the policy because we are better at taking users through their journey. It’s also true that agile methods and user centred design hasn’t actually changed the marketplace outside the Agency. We know what we want to achieve, and we know the size of the market place - 1,000-1,500 learning providers, 2.7 million young people, and 250,000 employers. We also know our current position in the market. So, we know the effect we want to have, who we need to work with, how we are working now and how we need to change to get better. We can use personas to understand how value for a user can lead to the outcomes we want. If we make ‘x,y or z’ better for Charlene what will the impact be on our service, and our business. If we know how to make life better for an individual we can project that onto the market as a whole and make assumptions about how the change for an individual will scale up. We know what we are going to do and the kind of impact we expect, so we can then measure whether we are having that impact. In other words we are managing the benefits.